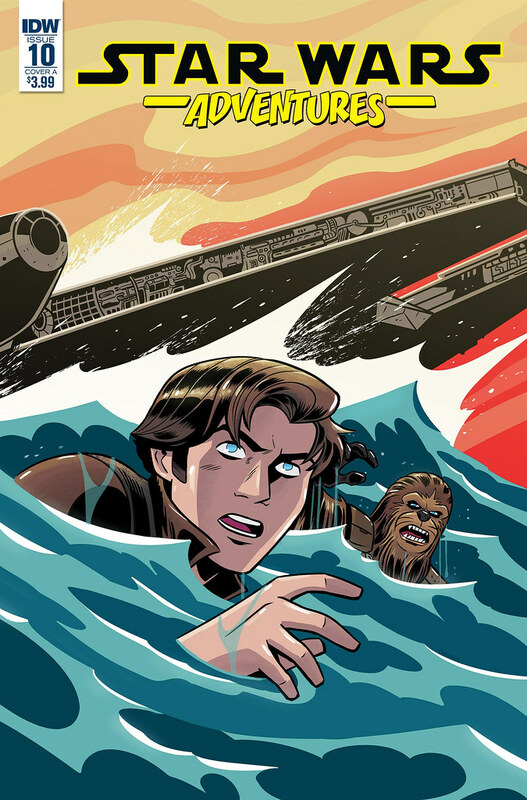 Star Wars Adventures #10 kicks off “Part 1” of the “Powered Down” story featuring Han, Chewie, Zuckuss and 4-LOM. That said, I’m not sure why it’s part 1 as the story began in the Free Comic Book Day issue. I guess you don’t have to read that one to follow along with this one, but it was a good story and it’s worth catching the whole thing. Anyways, this one picks up on some strange planet that causes both the Millennium Falcon and the Mist Hunter to crash which leaves everyone stranded on an island. Han makes an interesting choice to try helping the bounty hunters out from their crash only to find out it was a bad mistake. From there, he and Chewie figure out why they crashed, and they figure out how to undo it so they can escape. The catch is it unleashes an even bigger problem which they’ll have to deal with in the next part of the story. Next up is a Lando story where he tries to teach someone’s kid that being a criminal isn’t all it’s cracked up to be. We see the kid pulling off some scams, Lando trying to go legit, and then Lando trying to teach the kid a lesson. However it ends with both of them getting into trouble. In a surprise cameo, there’s the horse face guy from Canto Bight in this story, which is a nice pull. Like the Han story, this is a multi-parter, so it leaves off with Lando and the kid in trouble. It’s an interesting start to the adventure. Both stories have good artwork which utilizes different styles of cartoony. Derek Charm’s style is a bit cleaner and sharper, and his color palette is much brighter. Personally, I do like it more. But Charretier and Stern’s work is still good. All in all a solid issue with two enjoyable stories and some nice artwork. I give it a five out of five nexus.